The light of the Mediterranean and its contrasts, cradle of civilisation, have been a source of inspiration for Natuzzi since its beginnings. 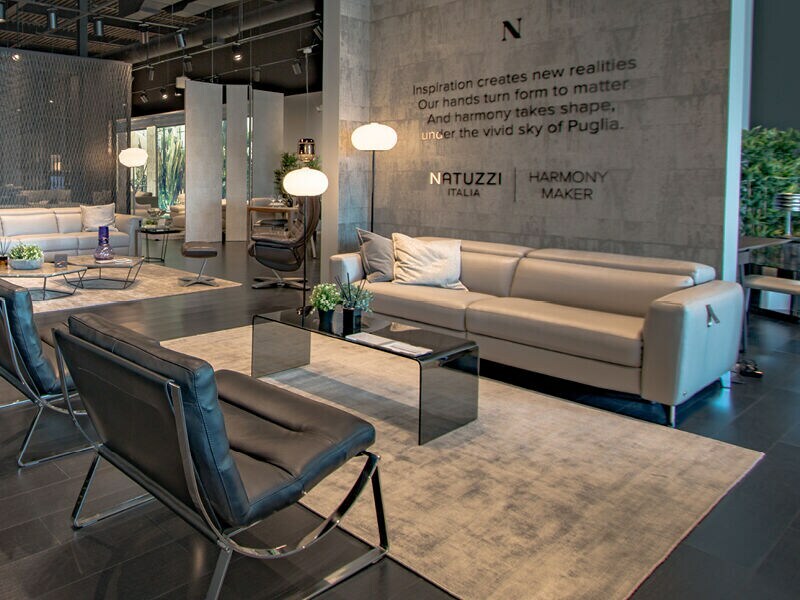 The group founded in 1959 by Pasquale Natuzzi is the largest Italian furniture company and one of the leading players in the global furniture market. The history of this group and its founder are well-known. As well as his business successes, Pasquale Natuzzi has distinguished himself for his commitment to social issues and for his vision, which have rendered him one of the leading Italian business men most appreciated in the world. 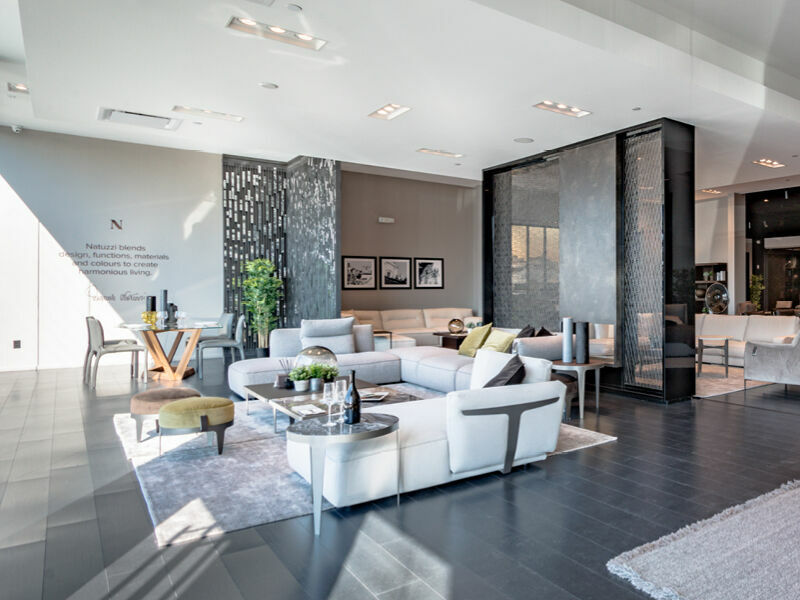 Natuzzi is the best known Italian lifestyle brand in the world for the furniture sector. The brands “Natuzzi Italia”, “Natuzzi Editions” and “Divani&Divani by Natuzzi” can be found in 123 countries and the widespread customer direct sales and technical support network is managed from 11 offices. Ethics and social responsibility, environmental awareness, continuous stylistic research, creativity, innovation, solid craftsmanship and industrial know-how and the integrated control and management of the entire value chain are the strengths of the group, which has been traded on the New York Stock Exchange since 1993. Unlike most Italian businessmen Pasquale Natuzzi had already understood, at the end of the nineties, the importance of the challenges arising from the globalisation processes and set about an important restructuring of the group, transforming it from a business to business model to business to consumer, focusing fully on the potential of the “made in Italy” aspect. In 2013 he launched a new sizable industrial plan for the product and the production process, with the aim of further improving the global competitiveness of the group, without trying to compete with developing countries in terms of price and render “made in Italy” products economically sustainable. In terms of innovation the Re-vive armchair is currently the icon of the group. The extraordinary design is combined with a simple and revolutionary idea: it’s not the body that must adapt to the seating position, but the armchair that must adapt to the characteristics and movements of the body. All this was achieved without internal mechanisms or manual devices, but thanks to a series of innovative design features. In terms of production Natuzzi has changed the production logics of the sofa, by adopting the industrial platform method, already used in the car industry. Previously sofas were assembled by a single worker in the same position. 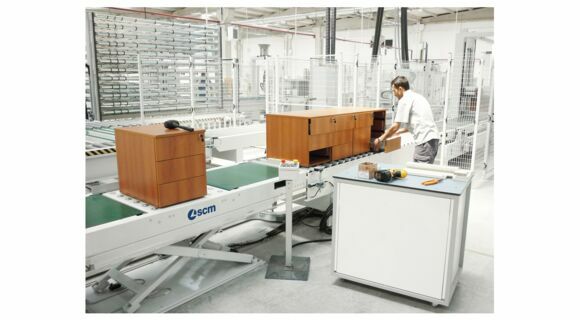 Now the sofa is designed by each individual component (used for various models) and assembled with the Moving Line production process, on which teams of assemblers work, fitting in sequence the various parts of the sofa. Currently 80% of Natuzzi’s turnover comes from models designed with the new platform approach and produced with the new process. The advantages are greater synergies, improved ergonomics of the work stations, reduced movement of the products and reduced risks of damages. The new process has guaranteed a further improvement in terms of quality and productivity. Using the Moving Line has changed the production considerably, this is why Natuzzi has introduced new solutions for the packaging process and this has given rise to the new collaboration with SCM. We have developed an SCM cpc semiautomatic packaging system for the finished products (sofas and armchairs), that meets precise specifications. First all the production line had to be compact and sized in relation to the Moving Line, easy to insert in the current and future layouts of the production plants, taking into account that the packaging follows the assembly and it is no longer in a separate department. Therefore it had to keep up with the faster product outfeed/completion pace than the previous production system. Finally it had to guarantee flexibility in use to meet the requirements and demands of the Natuzzi packaging, as well as allowing the customisations requested by specific customers, by inserting additional accessories and protections to safeguard the products. The packaging line has been built based on these requirements and SCM has met every customisation requirement for the machine. Today in the Experimental Laboratory of Santeramo in Colle, longstanding headquarters of the group, there is a complete packaging line operating with a Moving Line and perfectly integrated in the factory layout. Thanks to this innovation the packaging times have been reduced by 50%, compared with the previous manual system. The SCM CPC solution also improves the work of the operators from an ergonomic point of view and improves safety in the workplace. Thanks to the handling, lifting (both hydraulic) and the mechanical rotation of the sofa, the operator remains always on the same side of the station, reducing fatigue and unnecessary movements. The new packaging system has also improved the quality and exterior look of the package, because the greater level of standardisation of the process, guaranteed by the machines, allows for constant and preset specifications. Finally the use of the semiautomatic line allows the company to optimise the use of resources dedicated to the packaging and save on materials. The current production trends are for an extreme level of automation. In Natuzzi they believe in the combination of human knowledge and state of the art technologies, an extremely valuable company heritage. Natuzzi is not aiming for total automation, as they are fully aware that in this sector craftsmanship still makes the difference. As far as the environment is concerned Natuzzi employs the strictest standards. The concept of sustainable development has been applied to the production and sales processes. There is a substantial use of photovoltaic energy and technologies with a low environmental impact. The materials used are natural, such as wood and leather, and strict company policies have been implemented in terms of deforestation. Natuzzi has obtained the highest environmental and quality certifications because the group is aware that development is only possible if it’s sustainable. The certifications include the ISO 14001, integrated with the ISO 9001 quality management system. In 2016 Natuzzi obtained the FSC (Forest Stewardship Council) certification, given to companies that transform and/or sell products from certified forests.